We have created a set of cards using a generic logo that allows us to place any logo a client wishes regardless of the company. Click the button below to see design templates other agents have asked us to create. DISCLAIMER: Your Business Card Guy is not affiliated with American Family Allstate nor Farmers Insurance and makes no claim thereof. 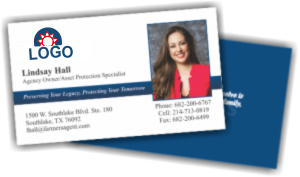 We provide business cards to Agents and Agencies directly. Most designs are derived from Agent requests, but it is your responsibility to follow rules as required by your membership.